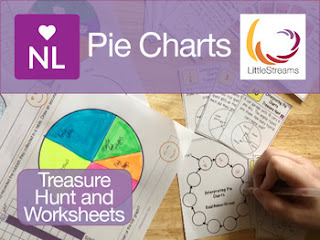 This free download is brought to you in collaboration with LittleStreams and it combines two fully differentiated resources covering drawing, reading and interpretation of pie charts. The first is a pack of six worksheets by LittleStreams the first four are of increasing difficulty drawing pie charts from tables and another two worksheets of increasingly difficulty drawing pie charts from bar charts. Solutions are provided for each worksheet. The second pack in this free download is a treasure hunt on reading and interpreting pie charts, it is differientated to three levels were the green (hardest) level is suitable for GCSE Higher. Each level consists of ten questions. Again the solutions are provided for teacher reference. Download is for the use of one teacher only.